I keep hearing people say they got a good start in January and then slacked off in February. Is it time for you to renew your commitment to being healthy? This is an on-line support group for those interested in getting fit, eating better, eliminating pain, reducing the effects of illness and improving overall health. I am an NASM Certified Personal Trainer and Fitness Nutrition Specialist, and this is YOUR opportunity to work a trainer without coming to the gym. You know what to do! You’re smart, and you read all the health-related things that come your way. But how do you decipher the information? How do you know what’s right for YOU? Where do you find support as you work towards your goals? And who is going to hold you accountable for doing what you need to do? 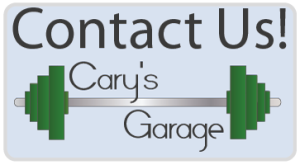 That’s where Cary’s Garage–Tools for Success™ comes in. By joining this month-long support group you gain access to professional guidance, science-based nutritional coaching, research-based suggestions and solutions, accountability, diet and fitness challenges, and other tools necessary for your personal success. The small group size allows coaching based on your personal situation. This also means that I’ll be keeping an eye on you and holding you accountable for participation because without that, there is no success! There is no “diet” being promoted and no specific product being sold. Participation is monthly, so there’s no long-term commitment other than to oneself. The groups are private which means that no one outside of the group members can see what’s being discussed. The cost for the group is $20 for a 4-week session, and the next session begin this Saturday, March 7, 2015. Group size is limited, and registration ends on Saturday am. If you’d like to join or have questions, please email me at caryd26@sbcglobal.net. Weighing In →← If only it were easy!